Ahead of its official debut at the New York Auto Show, Chevrolet took the wraps off its newest high performance Camaro variant, the ZL1. While the sixth generation Camaro SS we drove last year offered impressive performance in its own right, the ZL1 model promises to ratchet up the pony car’s capabilities significantly. Like the rest of the sixth generation Camaro lineup, the ZL1 rides on new light weight architecture that’s shared with the ATS coupe. As such, it’s expected to be more than 200 pounds lighter than its predecessor. Powering the new ZL1 is GM’s 6.2-liter supercharged LT4 V8, the same motor found in the engine bay of the C7 Corvette Z06 as well as the new Cadillac CTS-V. Here the LT4 generates 640 horsepower and 640 pound-feet of torque, an increase of 60 hp and 84 lb-ft over the 2015 Camaro ZL1. Set to go on sale later this year, perhaps the most surprising news about this new boosted Camaro is the debut of an optional 10-speed, paddle-shifted automatic gearbox. GM says the Camaro ZL1 is the first of eight vehicles earmarked to get this new transmission by the end of 2018, and it looks to provide faster shift times and better fuel economy than the eight-speed automatic currently found in other GM high performance models. For those that prefer to row their own, a six-speed manual with rev matching will also be available on the ZL1. Like the previous generation ZL1, the new model’s chassis is tuned for track duty with a specially tuned version of GM’s Magnetic Ride Control dampers, stiffer springs, lower ride height, an electronic limited-slip differential, and a more track-focused iteration of performance traction management. The new “hammer in the Camaro lineup” as Mark Reuss, GM’s executive vice president of product development puts it, will ride on 20-inch forged alloys with Goodyear Eagle F1 Supercar tires which utilize a compound developed specifically for the Camaro ZL1. Brembo six-piston calipers with two piece rotors are on hand to provide enhanced braking prowess. The new model’s exterior design puts an emphasis on aerodynamics and heat management, with the requisite front splitter, rear wing and new hood complimented by reworked front and rear fascias, wider fenders, unique rocker panels and a new grill design that provides more airflow into the engine bay. The track-focused theme continues inside the cabin, with new Recaro buckets, a flat-bottomed steering wheel, and an optional Performance Data Recorder. Check out the video to see and hear the ZL1 in action, and have a look at the press release below for additional details on the most powerful factory-built Camaro ever produced. DETROIT – The 2017 Camaro ZL1 is poised to challenge the most advanced sports coupes in the world in any measure – with unprecedented levels of technology, refinement, track capability and straight-line acceleration. Acceleration for the ZL1 is delivered with a new supercharged 6.2L V-8 engine estimated at 640 hp (477 kW), and either a six-speed manual transmission with active rev matching or an all-new 10-speed automatic. Handling capability starts with the lightweight, stiffer structure of the all-new sixth-Gen Camaro, married with Magnetic Ride suspension and an electronic limited-slip differential. Standard technologies include Driver Mode Selector, dual-mode exhaust and advanced connectivity features. The Camaro ZL1 goes on sale late this year. Functionality defines the Camaro ZL1’s form, with the exterior shaped during more than 100 hours of wind-tunnel testing and on-track validation to improve aerodynamics and cooling for track use. Accordingly, its exterior elements all play a part in managing airflow over, under and through the ZL1. The lower grille opening, for example, offers greater airflow compared to the Camaro SS, and the upper grille incorporates a new version of the “flow-tie” open bowtie insignia. There’s also a new hood, with a carbon fiber insert and heat extractor that pulls hot air from the engine compartment. Additional changes include a larger front splitter, unique rockers, a wing-style rear spoiler and wider front fenders – all tuned to improve aerodynamics for greater high-speed stability. Inside, there are standard Recaro front seats, along with a sueded flat-bottom steering wheel and shift knob. Chevrolet’s Performance Data Recorder is available. 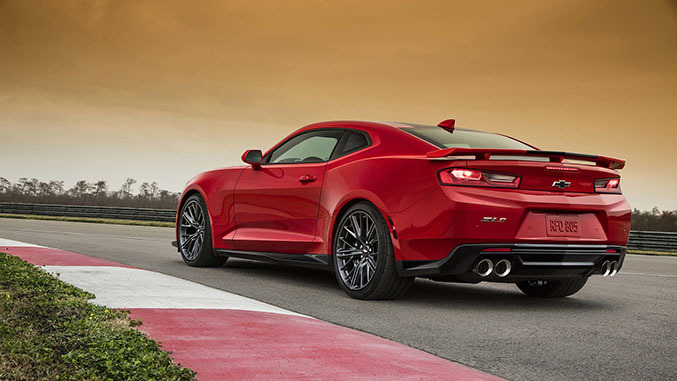 A cohesive suite of performance technologies tailors ZL1’s performance for street and track. Features include an updated Magnetic Ride suspension, Performance Traction Management, electronic limited-slip differential, Custom Launch Control and Driver Mode Selector. It also has a stronger power-to-weight ratio than its predecessor, weighing 200 pounds less, while offering approximately 60 more horsepower and 80 more pound-feet of torque. The result is a one-of-a-kind driving experience. Brembo brakes with six-piston monobloc front calipers – featuring the ZL1 logo – and massive, 15.35-inch (390 mm) two-piece front rotors. Underhood, the ZL1 features a supercharged LT4 6.2L V-8 Small Block engine, with intake and exhaust systems tailored for Camaro. It is rated at an estimated 640 horsepower (477 kW) and 640 lb-ft of torque (868 Nm). The LT4 is backed by a standard six-speed manual transmission or all-new, available paddle-shift 10-speed automatic. The 10-speed automatic has 7.39 overall ratio for smaller steps between gears. It enables the LT4 engine to remain at optimal rpm levels during acceleration, particularly when exiting corners, for quicker laps and lightning-quick responses on both up- and down-shifts. This is the first Chevrolet application of the new quick-shift 10-speed, with unique calibrations and hardware developed exclusively for the ZL1. By the end of 2018, GM will introduce the new 10-speed automatic in eight vehicle models. Finally – and unlike some competitors – there’s no need to purchase an optional package to make the ZL1 track ready. Track capability comes standard, with features including an impressive 11 heat exchangers for optimal powertrain cooling.